Pacific Climate Warriors Roll Out Anti-Coal “Red Carpet” for Angela Merkel at U.N. 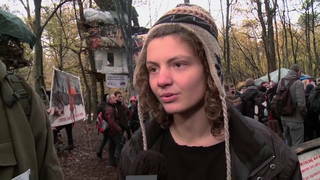 Climate Talks | Democracy Now! Broadcasting from the U.N. climate summit in Bonn, Germany, we look at protests underway against oil, coal, gas and nuclear power. Indian activists are demonstrating against India’s largest nuclear power station, the Kudankulam plant in India’s southern state of Tamil Nadu. Activists also disrupted a presentation by the European Investment Bank at an annual corporate conference held alongside the climate summit here in Bonn, with a protest against the construction of the Trans Adriatic gas pipeline, known as TAP, which is slated to run from the Greek-Turkish border, under the Adriatic Sea and into Italy. Meanwhile, activists had a special welcome ready for German Chancellor Angela Merkel on Wednesday before her address to the conference. AMY GOODMAN: We’re in the main plenary area of the U.N. climate summit. And a group of activists have just rolled out a red carpet—a little different than dignitaries are used to. It says on it, “Keep it in the ground,” with a finger pointing down. We’re joined now by two of the activists who rolled out that red carpet. Can you tell me your name? JESSE BRAGG: My name is Jesse Bragg, and I’m with Corporate Accountability. On Monday, we, alongside the Pacific Climate Warriors, delivered a petition from 100,000 people in the United States, on behalf of millions more around the world, demanding that the U.S.—because they’re not bringing anything to the table here besides the fossil fuel industry’s agenda, demand that they get out of the way of countries actually trying to make progress here, stop pushing the fossil fuel agenda and stop bogging this process down, so we can make progress on this agreement, because the world needs it. JESSE BRAGG: Well, three different officials from that office opened the door, recognized who we were and then shut the door. They did accept it, but they refused to discuss it. They just don’t want to face up to the reality that they are the only—now the only country that has no interest in being part of this process.